In Japan, eating and automation go together like, well, like raw fish and rice. 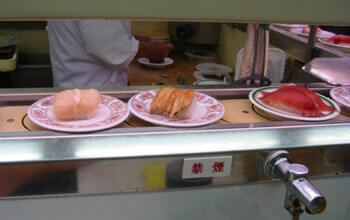 At kaiten-sushi restaurants, the food is prepared expertly by chefs, then placed on a conveyor belt. Customers pick what they want as it goes by. In the dim, pre-industrial past, restaurants used color-coded plates to determine the bill. A waitress would just count up the plates of each color, multiply, and present the bill. In the Roppongi Hills complex in Tokyo, the waitress merely waves an RFID reader over your pile of plates to prepare your bill. Each plate has an RFID tag implanted in the bottom of the plate; when scanned by the reader, the tag provides a unique number that corresponds to the price of that item. Science fiction fans have long enjoyed automated food delivery; see the robot bar from 1965. Read the first-person account at RFID in Japanese restaurants; thanks to Smartmobs for pointing this one out.